The term color blindness does not mean someone cannot see color. Color-blind people see color, just inaccurately and in a more limited manner, as their color perception differs from those who have normal vision. The colors with the most issues are reds and greens, less common are blues and yellows. Typically this condition is inherited on the X chromosome, but sometimes it can be caused by either physical or chemical damage to parts of the eye or brain. Color perception can also decline with age, as we regularly see here at Birmingham Vision Care, usually due to cataracts. Additionally, when inherited, this tends to occur more in men than women, owing to men only having one X chromosome. Since women have two, if one of them is affected, the other functional chromosome compensates for the dysfunction of the other. Seeing color is all about detecting light. Your eye’s retina is where the two light-detecting cells —rods and cones—are. Rods detect light and dark, while cones detect color. The three types of cone photoreceptors are red, green, and blue. This is how the brain determines color perception. White light contains all the colors on the spectrum, and normal color vision takes place when white light enters the eye, activating the three photoreceptors. The majority of color blindness happens when the eye’s red and green color responsiveness fluctuates and results in an overlap. This exaggerated overlap alters the distinct hues into indistinguishable ones. Consequently, this reduces the number of shades a normal color-blind person can see by as much as 90 percent. The EnChroma color blind glasses address this precise color confusion by discriminatingly filtering out light wavelengths where the responsiveness fluctuation occurs. The glasses shift the color overlap by reestablishing a more accurate ratio of the colors of light entering the eye, resulting in additional color accuracy and perception. 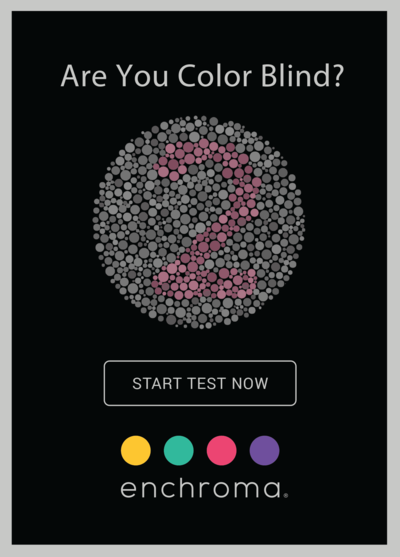 This is especially suited for someone with red-green color blindness. Color blindness is a layman’s term used to envelope a full range of color-deficiency conditions, from mild to severe. These life-changing glasses are designed to improve color vision in the most common category of color blindness—anomalous trichromacy—a spectral sensitivity in one of the cones. Happily this category describes four out of five cases of color blindness, usually in protanomaly, the milder condition where the red cone photoreceptor is abnormal, and deuteranomaly, the milder condition where the green cone photoreceptor is abnormal. Those who suffer from protanopia (no working red cone photoreceptor) or deuteranopia (no working green cone photoreceptor) may not benefit from these glasses since these people cannot see red and green color differences. Also people who have the rare blue-yellow color blindness, either tritanomaly or tritanopia, may not experience a change in vision with these glasses. Since the majority of color-blindness cases fall under anomalous trichromacy, they should respond well to EnChroma’s spectral lens technology. These glasses can give vibrant and bright colors to the wearer when dull and pale colors previously were seen. These glasses can be life changing, not only for viewing everyday life but also for careers in which seeing colors matters. Think about how important it is for an electrician cutting colored wires or a painter or artist working with different color palettes. If you are color blind and believe these glasses can improve your vision, or if you would like to gift EnChroma to family members, please call our Birmingham Vision Care eye professionals. Contact us at 248-539-4800 for more information on the amazing gift of EnChroma.